A reader tip (thanks Deo!) 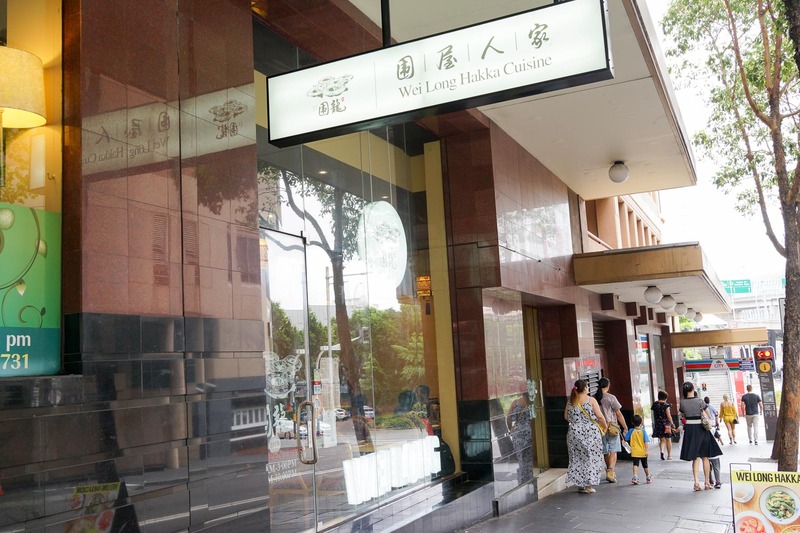 brings us to Wei Long Hakka Cuisine in the city. Salted buried chicken with rice - $11.80. We love us some salt chicken, it's what lured us in. And joy-oh-joy the lunch menu has salt chicken on rice. The chook does have a lovely saltiness to it, and an extra depth of flavour to the flesh that we couldn't quite put a finger on, the only words came to mind were 'extra chicken-y'. We'd say the same about the rice, but not to it's face. 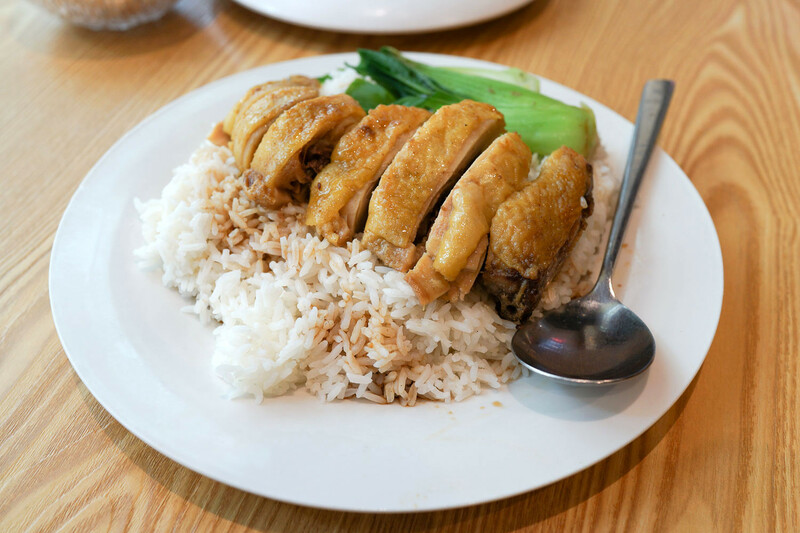 This dish is our favourite here, highly recommended to chicken-rice fiends. 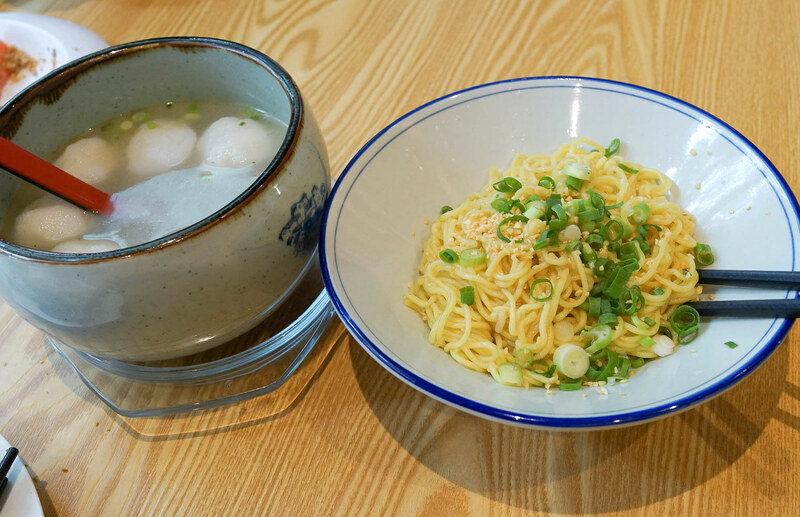 Also from the lunch specials menu we drawn to the Hakka Style Dry Noodle with Handmade Fishball Soup - $13.80. Lovely, gently flavoured, soft yellow noodles. Plain but oh so fine. The fishballs are in a simple clean broth. A great dish on a hot day. Orange dust tomatoes - $11.80. Cool tomato slices sprinkled with what we guessed to be plum powder, with that odd sweet/sour almost chemical-y flavour, but we'd put some money on these folks being right who said it was dried orange skin. We loved trying it but the flavour combo befuddles our Western tastebuds. 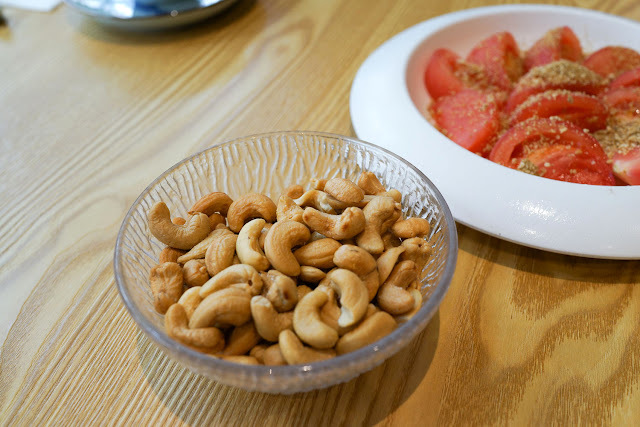 Out of curiosity we ordered house made salted cashews - $8.80, which tasted just like salted cashews. 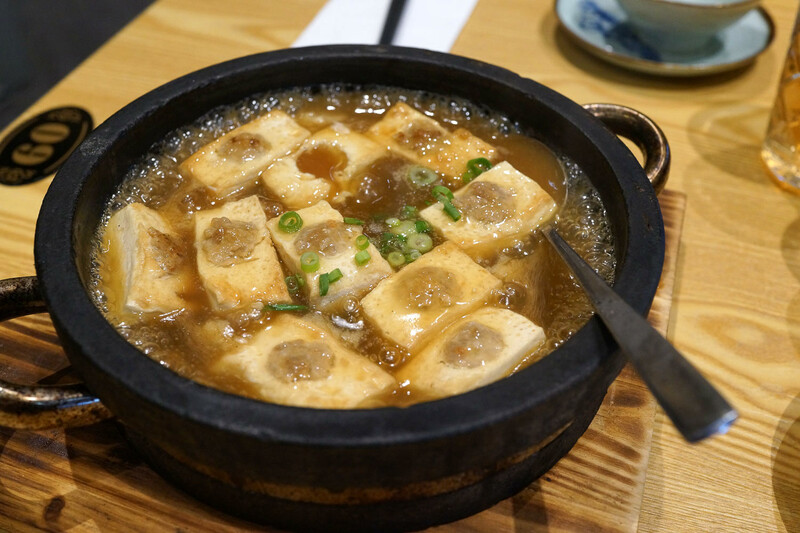 Stuffed tofu - $23.80. We order this for the mystery value - what is it stuffed with? Turns out to be minced pork. 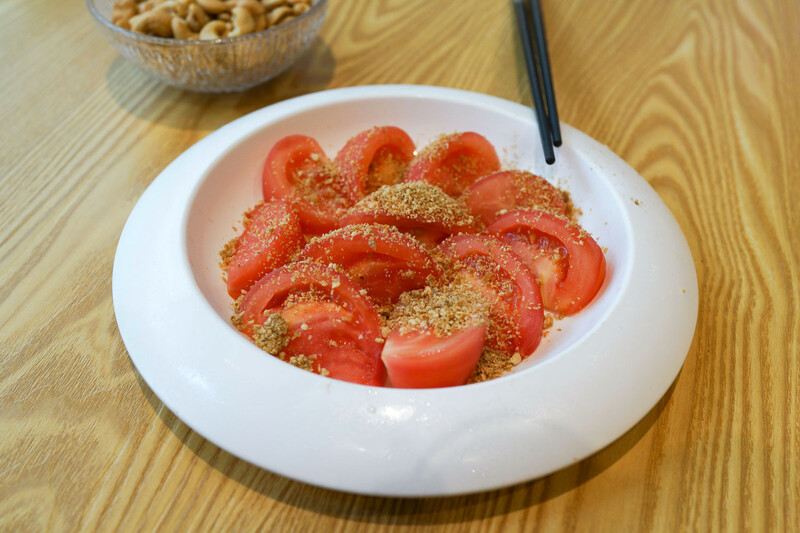 It's a plain dish that would work wonders when partnered with something saucy or spicy. After a couple of visits and some Google edjumacation, we learn that Hakka food is more about the flavours of ingredients rather than spice or saucy sauces, similar to Cantonese. Tea leaf pork - $23.80. 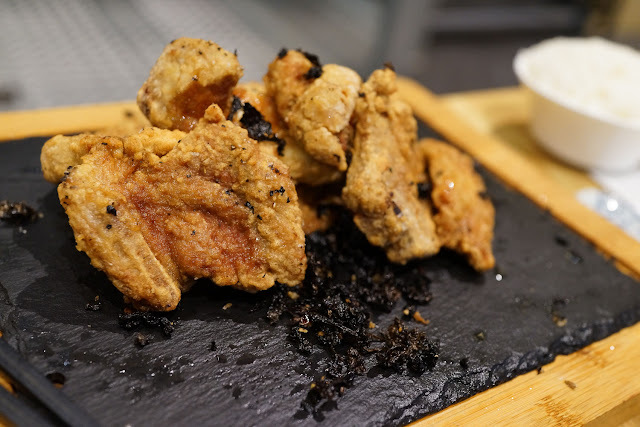 This was another mystery pick, turns out to be very nicely deep fried pork chops. We didn't get a big flavour hit from the tea leaves, or whatever they were, but the fried pork chops happily stood up on their own. After a couple of visits we feel we haven't got to the heart of this resto, there's a bunch of dishes on the menu we are keen to try, we'll be back. Wei Long Hakka Cuisine is at Shop 330 295/289 Sussex St - corner of Sussex and Bathurst, entry on Bathurst Street. Good choices, I also love the noodle and fish balls and my wife love their salt chickens. Next time, you should try their Hakka special i.e. Beef in Rice Wine Lees and Preserved Vegetables and Pork Belly with Rice. Don't forget to ask for their Hakka-style chilli sauce which is uniquely vinegary. We'll give the beef and pork a shot next time, sounds like a good combo. Thanks again for the tips!